Our longtime friends at Catch Magazine have consistently produced the highest quality digital publication for many years now. And when it comes to representations of best case handling of fish that are released, they absolutely get it! It's awesome to have our own feature article "A MOBILE VIEW" which can be found in the April/May 2018 issue. If you don't already subscribe to Catch Magazine but can't get enough of the greatest fishing adventures on the planet, you're missing out! Enjoy this excerpt from issue #56 with photo and C&R handling tips from our own Keepemwet Fishing staff and Ambassadors! Make sure you have enough phone storage before you get on the river. Erase photos you don’t want. I’ve been in the middle of taking photos and received a message saying storage full. Photo by Marty Sheppard, KWF Ambassador. 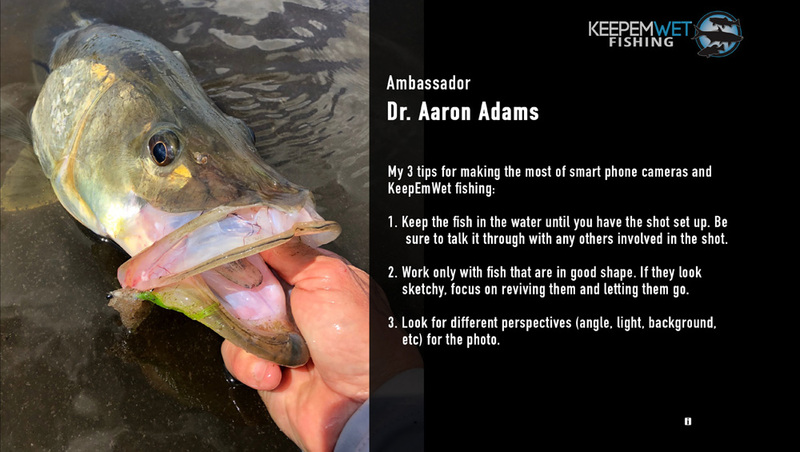 Photo by Dr. Aaron Adams, KWF Science Ambassador. Left - 3. Use the video mode for lens option different than photo mode and the ability to capture more of the experience then simply save the best still frames from the video! Photo by Sascha Clark Danylchuk, KWF Operations/Science Liaison. Right - 4. A common misconception about Keepemwet is a perceived opposition or conflict with grip and grin photos. While we work to raise awareness of the impacts surrounding various handling practices, it's a no-brainer to handle fish with care and get great photos too. My better half Ali demonstrates with ease on a cool October day last fall. Captain Rob Kramarz holding a Permit in the Florida Keys. This fish was caught as part of a Bonefish and Tarpon Trust tracking study led by Jake Brownscombe aimed at understand habitat connectivity in the region. The visible dart tag is used for individual identification in case of recapture, while an internally implanted acoustic tag transmits a unique signal that is used for spatial tracking. Photo by Dr. Jake Brownscombe, KWF Science Ambassador. This is the most air he saw, and it was only for a quick second. I tell people to hold the fish completely under the water and just lift it enough so I can see it's eye. Only takes a second or two and I shoot as many photos as I can, rapid fire. One usually turns out crisp. 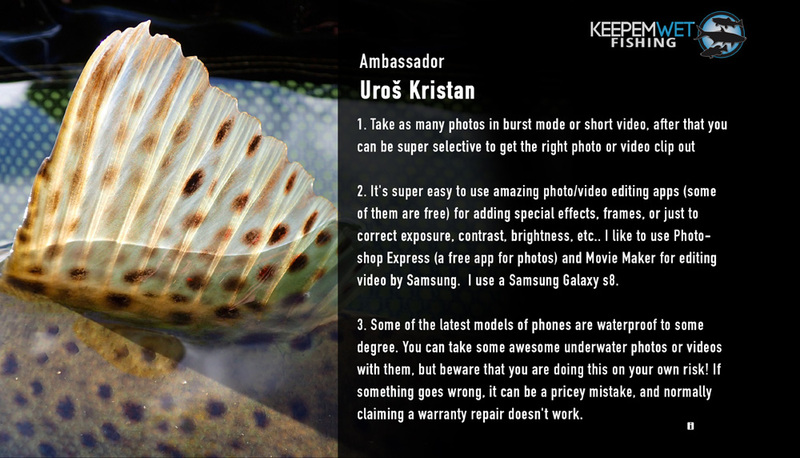 Photo by Jeff Hickman, KWF Ambassador. Left - Nets allow the fish to recover IN THE WATER while you compose shots. Gentle a-okay grip around the wrist of the tail with non camera hand can point and steer the fish angle and direction. Keep the head in the water and use the net to support the fish for various positions at water level. Right - Take lots of photos in seconds by holding the button down. Get as many photos as you can fast. Blue Marlin: Two time Stanley Cup Champion, Tofino Resort and Marina owner and Keepemwet supporter, Willie Mitchell releases his first Blue Marlin in Abaco, Bahamas. Photo by Keepemwet Fishing Ambassador Captain Tony DiGiulian. Keepemwet Ambassador Anthony DiGiulian releases a sailfish with IGFA President Nehl Horton. Leaders lead by example, 24/7 and 365 days a year. Known as the "fish who can stop dam construction," "fish of a thousand casts," "cousin of Taimen, our king of the streams Hucho hucho (Danube salmon)"... Take a snap, release it and you will have the lifelong memory of your fish of a lifetime. Photograph by Uroš Kristan, KWF Ambassador. Sometimes you find big things in small details, even if it just sun coming through a dorsal fin of a nice brown trout. Nice example of pure Danubian strain brown trout from the Obrh River... they fight hard to push out the introduced Atlantic strain of brown trout from our rivers. Not equally loved around the planet, but really important for the fly fishing community here in Slovenia, this trophy grayling "Lady of the Stream", was caught and released in early spring on the Iščica River. Here's a wild rainbow trout buck from the Idrijca River. They are almost native now, but at the same time totally alien ... future unknown?! Here's a baby marble trout from the emerald daughter of mountains, the Soča (Isonzo) River . Please #keepemwet and Catch & Release for generations to come. net is Glen Pointon Living The Dream Catch and Release Net.